Very early in the morning (around midnight), we begin our push to the summit. This is the most mentally and physically challenging portion of the trek. The wind and cold at this elevation and time of day can be extreme. We ascend in the darkness for several hours while taking frequent, but short, breaks. Near Stella Point (18,900 ft), you will be rewarded with the most magnificent sunrise you are ever likely to see coming over Mawenzi Peak. 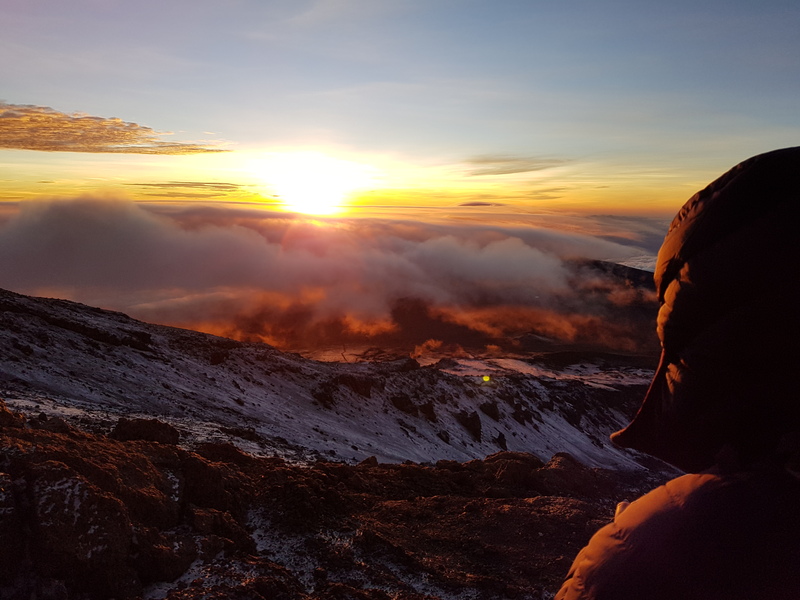 This is a challenging post to write, but it is the post that needs to be written now – how we summited Mount Kilimanjaro on April 7th and 8th. We trained very hard for this climb and our training never let us down. 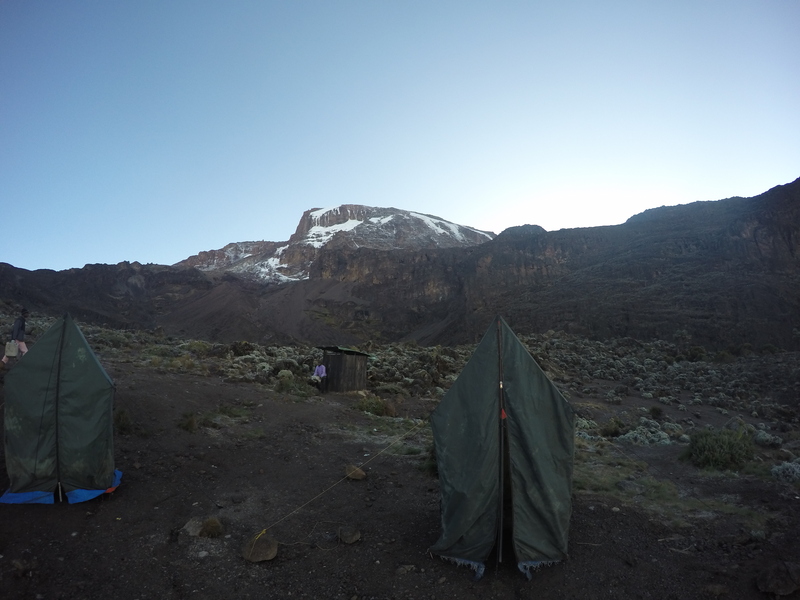 We were able to trek for days up the Machame Route, considered a high difficulty route, especially in the rainy season. Because of the roundabout nature of the route, we saw the summit almost every day, although for days the summit seemed elusive and distant. How we were going to summit such a massive peak remained a mystery. We worked our way up through the camps, dealing daily with less oxygen, to the point where it was a major struggle to put your socks on in the morning. Scurrying up a short incline would leave you breathless and all our Canadian and Tanzanian guides had to warn us not to rush – ever. 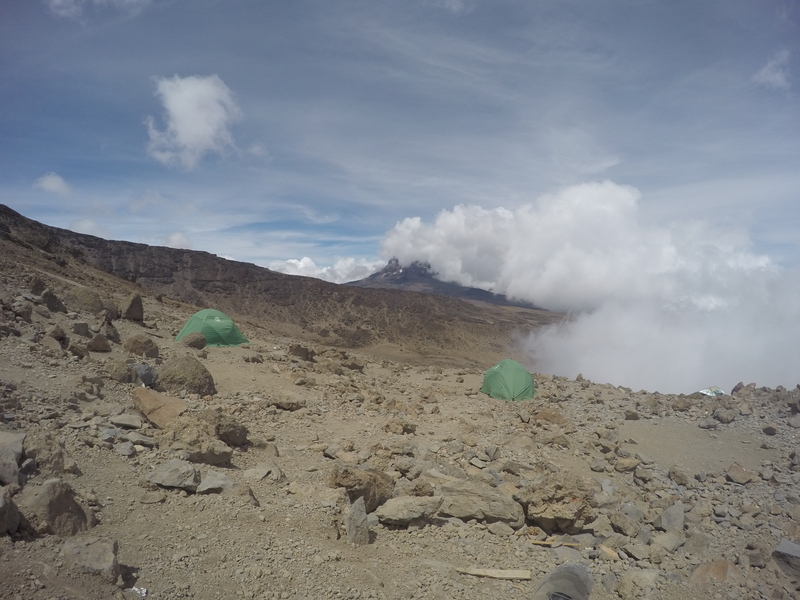 Our approach to the summit involved a 5-hour climb to Karanga Camp (elevation 13,106 ft). We realized that we would never sleep at this camp. We ate a great lunch (the food was always great!) and then rested for the afternoon. At 6:30 PM we all gathered for dinner and were organized into three summiting groups, each led by a Canadian and Tanzanian guide. I was part of the first (slowest) group and we were instructed to be ready to summit by 11:00 PM that night. At the appointed time, we gathered up in a straight line in complete darkness, illuminated only by our headlamps. We were in utter darkness, totally dependant on our guides, heading now to a summit that was invisible. Soon, the weather turned vicious. The group was buffeted by very strong ice cold winds that cut through all of our clothing layers. We hid behind rocky outcrops to get respite from the wind and to layer up. Eventually, I was wearing everything I had with me – two tightly woven merino wool layers, a hard rain shell, my down-filled Kilimanjaro puffy and another hard shell. This bizarre combination seemed to do the trick, allowing me to move without being cut in two by the winds. We climbed very slowly through the night, sometimes with our guides who encouraged us to dance and sing to keep warm, sometimes on our own. The night went on forever. Far below, we could see the second group coming up the trail by their bobbing string of lights. At some point, probably around 7:00 AM, we found ourselves on a broad, steep slope. We were scattered all over the mountain with no real sense of where we were heading. This is when high altitude really began to kick in. Nothing can prepare you for this. 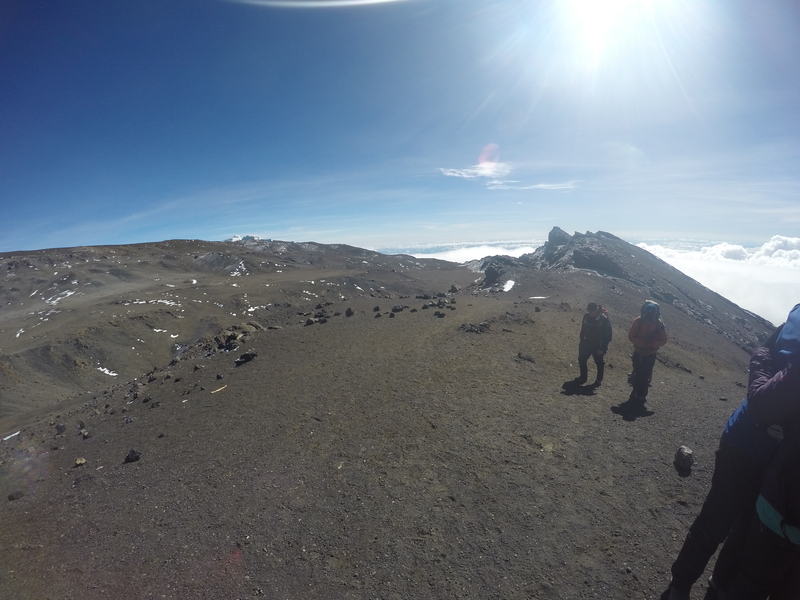 It is very easy to get disorientated above 18,000 ft and as a group, even with the encouragement of our Tanzanian guides, we really didn’t know what we were doing. We decided as a group to continue up the mountain face, even though it was impossible to see the summit! We were reaching for the crater rim – Stella Point (elevation 18,884 feet). The summit was really a long ridge and I really didn’t know we were at the summit until I stumbled up to it. We had probably been climbing for around 11 hours at this point and our little group was totally exhausted. 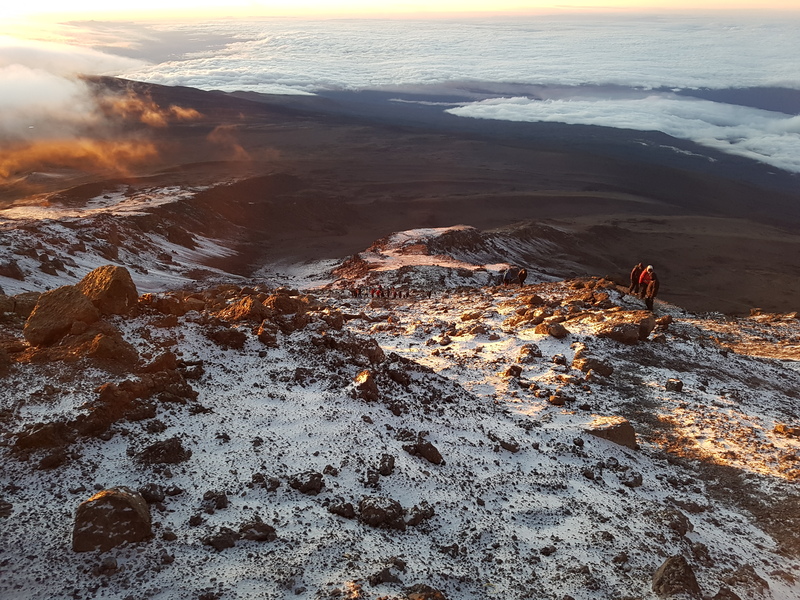 We could have continued to move on the Uhuru Peak, but almost all of our group was wiped by the night climb and only three of 30 climbers made it to the next peak on the volcano rim. This was an incredible feat. As I wrote about the Barranco Wall, it takes a few days to realize what an achievement this is. It is starting to sink in at this point, especially the incredible will power it took to make that night climb. 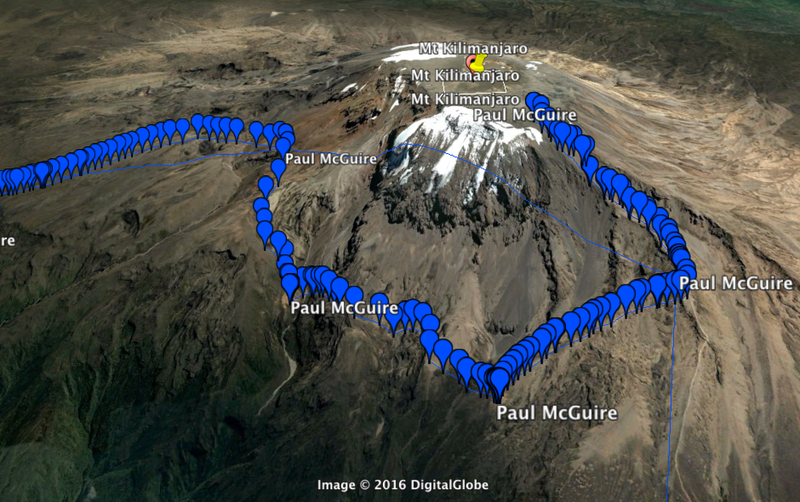 We did really well – 28 climbers summited at Stella Point. The general overall success rate is around 65%, so we did much better than the average. I think our success has a great deal to do with the incredible training and leadership of our Canadian guide team – Shawn Dawson, Kristi Johnston and Jason Colley and the amazing support of our families and friends back home. The climb is over, we are safely home, we have achieved something special. So incredible….heartfelt congratulations Paul!!!! I’m so glad you created this blog.